A big thank you for all the guests who stayed with us over the Easter period. We hope you enjoyed your stay. We all had a great time. The park was full of fun and excitement and the kids had a ball. With a lovely sunny Easter Sunday, we held an Easter hunt and colouring in competitions for the kids with a massive turn out. Even some of the adults got involved. Congratulations to Keeley, Martin and Angus the winners of the colouring in competition. Now that Easter has been and gone it is time to rebook for next year. Spots are filling up fast so rebook your site today. This Saturday the 7th of May, we have our yearly Triathlon happening. Are you apart of the race or just coming to watch? The race goes straight past us so why not come and stay and get in all the action. If you want to enter in the race go to their website byronbaytri.com.au and follow the prompts. 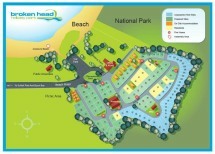 So what are you waiting for come stay with us at Broken Head this week to be where all the action is!!! Please contact our friendly reception staff on 02 6685 3245 for more information!